Once you reach the harbor of Sissi, a magical Mediterranean landscape unfolds in front of your eyes. A beautiful balance of sea and mountains, welcomes you in this serene traditional village where time stands still. Imagine picture perfect sea views, colorful fishermen boats gently rocking inside the blue waters of what resembles a big natural swimming pool and alluring mountains, marked with several hiking paths. Sissi is indeed a paradise for nature lovers. There is nothing pretentious about this place, on the contrary here you will find authenticity at its best. This picturesque humble village caters to all tastes and budgets. Visitors may choose to stay in one of the few small hotels, studios and apartments. For those who prefer to experience the natural surroundings — may do so at a campsite. We’ve compiled a guide to everything you need to know about Sissi and why you should add this village to your Cretan holiday itinerary. Take the serpentine coastal route through olive groves and you will reach the charming fishing village of Sissi. Situated 45 kilometres east of Heraklion this tranquil settlement is nothing like the nearby tourist hubs of Malia (8 km) or Hersonissos (21 km). There is a daily bus service to Sissi but it is not regular. If you are traveling from Heraklion then you can take the Heraklion – Sissi — Milatos route. For more information and tickets check out this website or call +30 2810 24 65 30. To make the most of your visit we recommend that you rent a car in Sissi which will give you the freedom to explore all that Sissi has to offer at your own pace. During the three years of the Cretan Revolution (1866–1869), Sissi was an important strategic location for uploading guns and munitions against the rebels who had set their eyes on the Lassithi’s shores. Today, the village has managed to preserve its unique traditional charm. Despite its small size, this peaceful coastal resort offers a few activities one can enjoy in this part of Crete. Here are some of our recommendations for a fantastic trip to Sissi. The few local tavernas which line the historic harbor of Sissi have gained quite a reputation of serving some of the best seafood on the island. No wonder the tavernas are overflowing with joyful crowds of regulars who come here all the way from Heraklion to enjoy the fresh catch of the day along with other meze dishes, paired with the locals’ favourite drink — raki. While you take-in the postcard perfect view of the harbor watch out for the fishermen’s wives cleaning the catch of the day right by the seashore. On a hot summer day you might also like to treat yourself to a refreshing swim on the small sandy beach, located just across from the harbor. The sea here is always calm, thanks to the long narrow bay which was formed from the Aegean Sea carving the rock surface over the centuries. The village of Sissi is characterized by its narrow winding streets, old houses shaded by blossoming bougainvillaea, colourful doors and picture-perfect store fronts. Have your camera’s handy as you will definitely find plenty of photo opportunities here. The landscape around Sissi is blessed with beautiful flora and fauna, which can be enjoyed on a scenic hike or bike ride along one of the biking or trekking paths that surround the village and the greater area of Lassithi. Breath in the fresh mountainous air while admiring the spectacular views of vineyards, olive groves and traditional villages — a true feast for all the senses. Watch out for the unique and diverse bird species which call this part of the island their home. Check out our previous post on the 10 Top Birdwatching sites in Crete. An important pilgrimage site, the Monastery of Aghios Georgios (St. George) located in the gorge of Selinari, a short 3.5 kilometres drive from Sissi dates back to the 2nd Byzantine era. There are two churches in the area, one dedicated to the Epiphany and the other to the Resurrection. The small 16th century chapel is home to a miraculous icon of St. George, the protector of travellers. During your trip to Sissi, how about visiting one of the Minoan palaces of Crete, the Palace of Malia, located 4 kilometres west of Sissi. The third largest Minoan Palace was first excavated in 1915. Its first inhabitants lived here during the Neolithic and early Minoan period (6000-2000 BC). Sissi has a few small sandy beaches which are well protected from the northerly Meltemia winds, making it a perfect spot to sit back and relax from the bustle of other popular coastal towns. To the east there is Boufos Beach which is an organised beach with umbrellas and sunbeds available for rent. The beach is a mix of rocks and sand, wearing sea shoes is recommended. There is also a snack bar on the beach with a sitting area overlooking the sea. Heading a little further east of Boufos Beach you will find the Avlaki which translates as the little garden and is a small beach that was formed at the exit of a narrow bay. By the following the coastal road you will reach the hotel Kalimera Kriti which has an organised beached with shallow waters that are ideal for children. On the other side of the hotel lies Spiliada which has a more relaxed vibe than the other beaches in the area. It is a sandy beach shaded by tamarisk trees. Once you have explored the village of Sissi head further east towards the tiny village of Milatos. The drive is approximately 15 minutes long (7 km) following the road towards Elounda. Milatos is a small settlement and home to about 20-30 people, there is also a small expat community in this part of the island. The pride and joy of Milatos is its picturesque harbor. Here, you will find a small beach and a handful of cafes and family run tavernas. As you might have already guessed by now, fresh fish is their specialty and like its neighbour Sissi, you will surely spot fishermen land their catch of the day. Milatos is a quiet part of Lassithi, an ideal retreat for those seeking to unwind and de-stress. If you wish to escape to this part of the island then renting a small apartment is your best option. The main attraction of Milatos is the Milatos Caves which are located approximately a 30 minute drive, on the hill that sits above the town. The view from here is quite remarkable. The caves can be reached on foot, following a winding, narrow path which overlooks the stunning scenery of a deep gorge. The first stop would be at the tiny church which dates to 1935. It is a memorial to those who lost their lives in a fight against the Ottoman Turks in 1823, during the Greek War of Independence. The inhabitants of Lassithi used the caves to escape from the invaders. The caves are quite deep, there are a total of eight entrances. Flashlights are available for rent at the starting point of the route. A trip to this part of Lassithi is a wonderful opportunity to discover smaller, authentic villages that have managed to preserve their unique character. 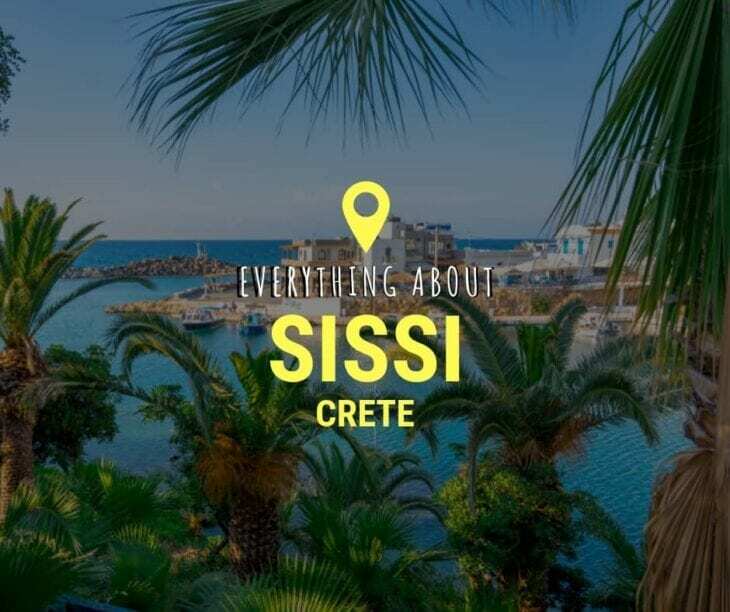 We hope that our guide to everything you need to know about Sissi will be useful in planning your road trip around Crete.